You can see from the equation, that the efficient frontier is a parabola in mean-variance space. The covariance matrix for our example is shown below. In practice, the historical covariance matrix can be calculated by reading the historical returns into Octave or Matlab and using the cov(X) command. Note that the diagonal of the matrix is the variance of our four securities. So, if we take the square root of the diagonal, we can calculate the standard deviation of each asset (13.6%, 14%, 20.27%, and 5%). The example script for computing the efficient frontier from these inputs is shown at the end of this post. It can be modified for any number of assets by updating the expected return vector and the covariance matrix. Deriving the approach I have shown is beyond the scope of this post. However, for those who want to dive into the linear algebra, there are several excellent examples available online. This script will also work in Matlab, but I’ve chosen to use Octave since it is opensource and available for free. in injection molding i have 2 defects (warpage&sink marks) they are controlled with variables(pressure&temperature) and i want to study the effect of the combination between these 2 variables on the 2 defects by using the efficient frontier . I really appreciate your articles. 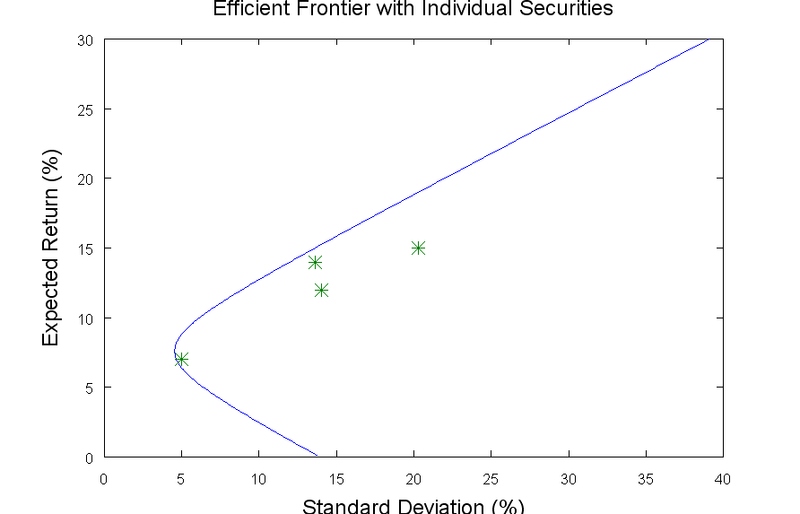 Question: Is it possible you have the definition of efficient frontier wrong. It looks to me like you are describing how to calculate the minimum variance frontier as opposed to the efficient frontier. hi.can you tell me how i can calculate entropy of portfolio wieghts with matlab codes??? I’m wondering whether one can calculate the weights of the portfolio corresponding to a point on the frontier? Hello this is incorrect. You need to calculate the global minimum point which is mu=A/C i.e. you defined mu incorrectly. Then you increase mu by some increments and calculate corresponding Variances for given mu. Also is there a way to plot the Capital Market Line i.e. portfolio of risk free assets and risky assets (tangency portfolio)?